Had breakfast, but wanted to snack before lunch. Well, there are delicious recipes for families at home. His name is banana caramel cheese. From the name has been delicious and delicious delicious yes. This recipe also you can save for the menu iftar in Ramadan that will soon come. Before getting into the recipe, did you know that on average one in three people consume more than three snacks per day. This is revealed from the results of research conducted by Mondelez International hobby of eating snacks in Indonesia or Snacking Habit Report: Indonesia published in 2017. Let's start cooking now. The materials needed are not too difficult really. Peel the ambon banana or kepok then split into two parts. Heat teflon over low heat, then add butter. After that sprinkle teflon that has been smeared butter with sugar, wait until golden color. 2. Add grated cheese according to taste. Then, sprinkle chocolate ceres. 3. Finally mixed with sweetened condensed milk. 4. Caramel bananas are ready to serve while warm with tea or coffee. 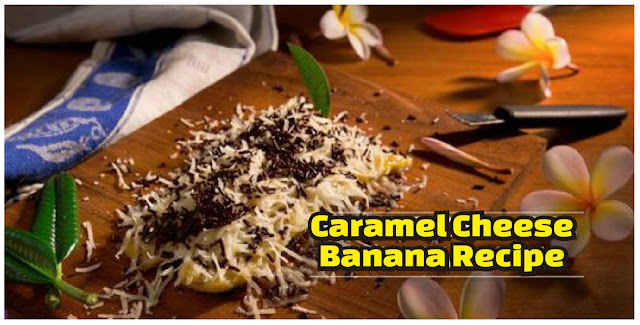 1 Response to "For the hooked snack: Caramel Cheese Banana recipe"
Should we try this delicious caramel cheese banana recipe at home because it sounds great and I think it would be a new recipe addition for food lovers.